Hi, I'm Emma Millis and I am the owner and manager of Dogknows in Greenwich. I studied at Hadlow College and was awarded my National Diploma in Animal Management, during this time I worked with all kinds of animals but it's dogs that I am really passionate about and I have the pleasure of sharing my life with three hilarious dogs - Bailey the Beagle, Spencer a minature Dachshund and a new addition, Nellie, also a minature Dachshund! 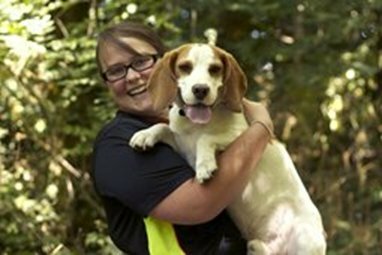 I continue to extend my knowledge of dog behaviour and enjoy training dogs in our care and sharing my experience with my team and our dog-owning-customers. I really do thoroughly enjoy what I do. So, if you are looking for dedicated dog specialists to help with the care of your dog please get in touch. I am often out with dogs and driving during the day, so texting or e-mailing is a great way to send me your details so I can call you back as soon as I am free. If you prefer you can send an enquiry form. Because our policy is to take on regular clients who need dog care at least three times each week, it is possible to get to know each dog really well which means we understand their individual characters and traits so we can provide the best possible service for them. Incorporated into each dog care service plan is our Everyday Dogknows Training Programme. By using kind, force-free handling we bring out the best in your dog!